MISS NATASHA ENQUIST: ELECTRO-ACCORDION CHANTEUSE: Opening for The Tequila Mockingbird Orchestra! Yes! 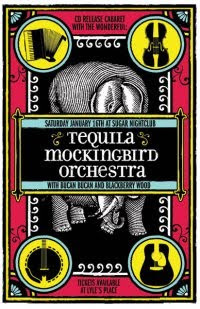 My gypsy band and I will be playing with The Tequila Mockingbird Orchestra, as well as Blackberry Wood! We will be playing two shows with them, all for The Tequila Mockingbird Orchestra's CD Release! Let's celebrate!